Another simple tasting at home this evening, made more simple by the fact that poor Fiona’s suffering from a stomach bug. So tonight, I’m on my own. This winter norovirus has hit everyone in our family and most people I know in Brussels -- some of them twice. It’s a nasty virus, and apart from saying that it pretty much takes over your guts for a day or two, I’ll spare you the details. Interestingly, though, I’ve not caught it, and I think I know why. A daily beer. 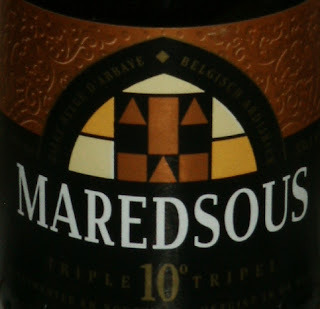 So, onward to tonight’s medicine: Maredsous 10° tripel. 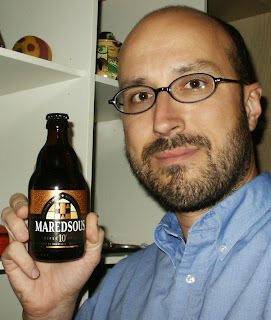 According to the label, which is one of the most beautifully designed in the 40b40 so far, it is an “abbey beer brewed to the traditional methods of the Benedictine monks of Maredsous”, which is south of Namur, in Wallonia. Read a little further, however, and you’ll see that the the Moortgat Brewery (known for Duvel) near Antwerp in Flanders now brews the beer for the Abbey of Maredsous. It pours a honey amber colour with a medium head. The first taste is the alcohol, I’m sorry to say. It’s a powerful 10%, and, initially at least, there aren’t enough other flavours to balance it out. More kick than caress. After a few sips, however -- or once the tongue is anesthetised, perhaps -- some other tastes make themselves known. Apple in the middle, and maybe the creamy richness of cantaloupe, all turning bitter to a hoppy finish. It’s OK, but I’m not a big fan, really. If I’m going to drink something with such a strong alcohol content, then I have to have other tastes to balance out the fumes. I think of the Rochefort 10 which though 11.3% alcohol is a complex mouthful of gingerbreads, spices and malt flavours. 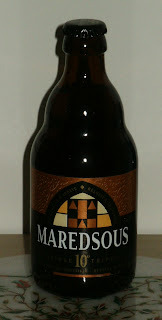 Still, Maredsous 10° tripel beats Piraat, another imbalanced ale of high alcohol content, hands down. And at least I can rest assured the yeast in this beer is keeping me from getting the horrific stomach virus that’s going around.